Last weekend was an exciting time to be in Hong Kong. 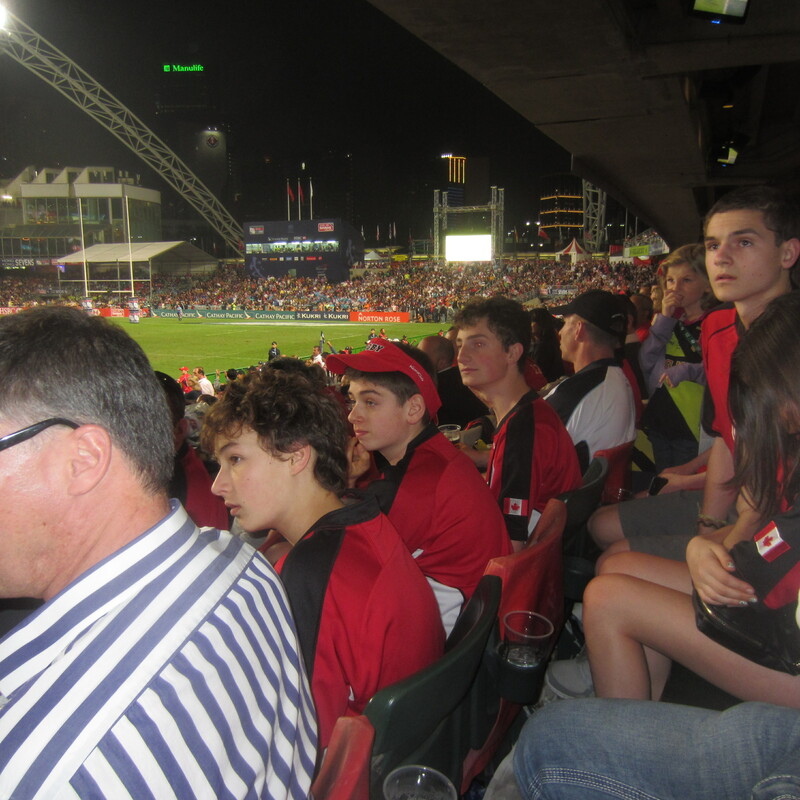 We were there to watch the rugby 7’s. But, Sunday was also the day a new leader was chosen. It marked the start of Spring Break for my boys and we have had 8 friends from Vancouver visiting us in Beijing who came along too. The logistics of keeping 12 people organized, amused and fed was daunting but John rose to the challenge and proved to be a formidable concierge. As a result we all had a blast and have sworn to return next year (March 22 to 24. 2013 in case anyone else wants to join us!). While I have been told the rugby is fantastic (and I actually enjoy watching it), for me, the people watching is the highlight of this event. 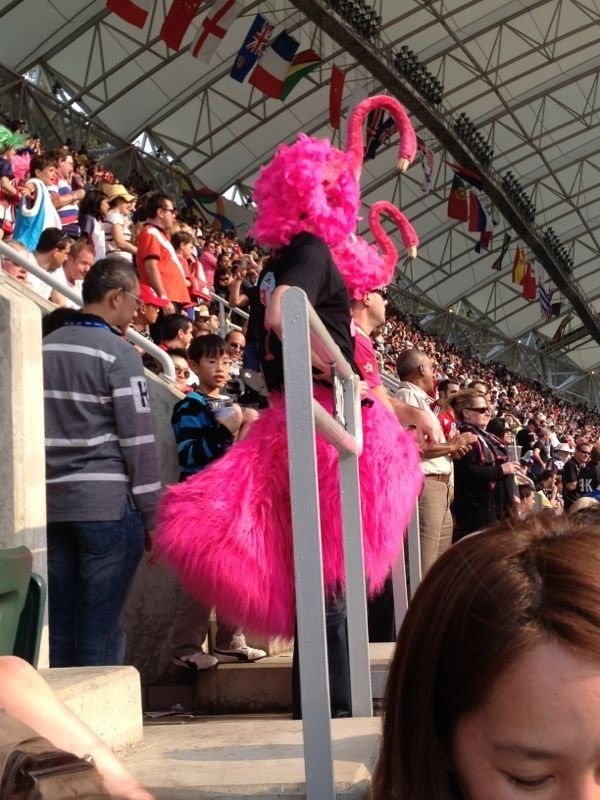 There is a wonderful carnival atmosphere in the stadium with more and more people coming in fancy dress every year. The costume range from clever (one group decked out as pan am pilots and stewardess, another as sushi, to silly (jelly fish, rabbits, flamingos) to naughty (giant condom costumes and very scantily clad young girls!). We saw Lady Gaga, King Tut and six different Elvis’s. 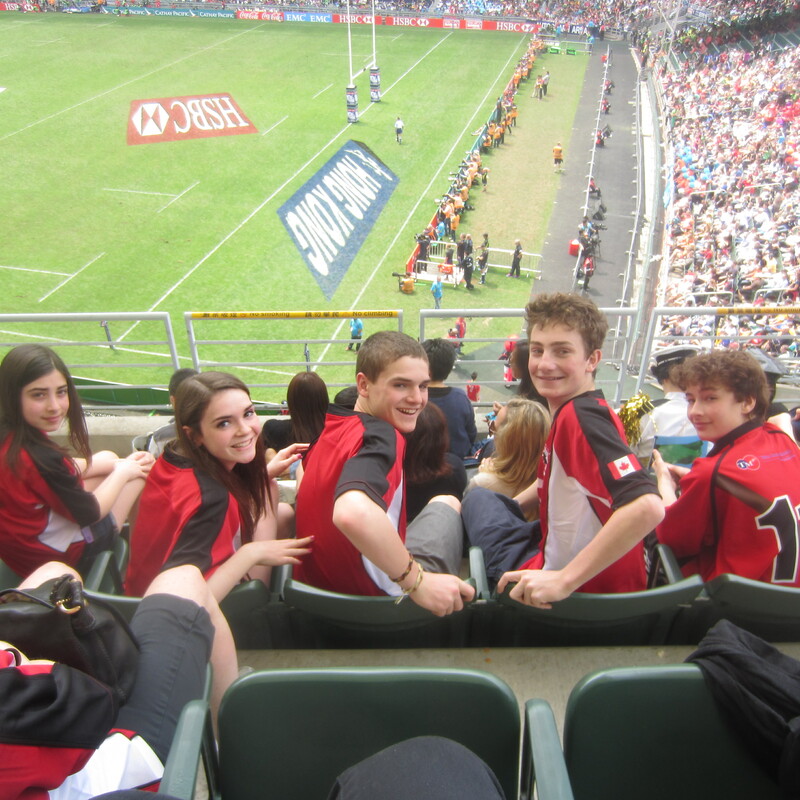 Our group all had matching authentic Canada rugby team jerseys. Not outrageous, but did make us easy to find in the stands and our loyalties clear. Every year we swear to return the following year with the best costumes but never quite get it organized… maybe in 2013! We are brainstorming now. 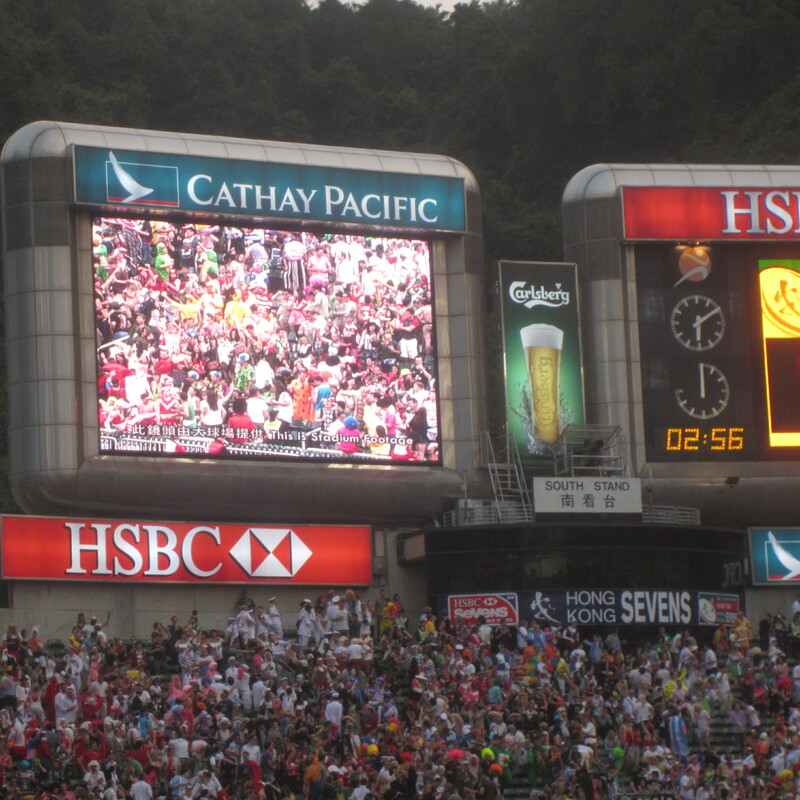 The Sevens are probably the biggest sporting event in Hong Kong and a great party. People tend to get quite tipsy. We had one guy yell, “Go Canada” at us at 11 am. He was so drunk we worried he would fall over the protective railing. Luckily everyone seems to be in a good mood regardless of their condition or how their team is doing. Somehow, everyone is friendly and cheerful and you feel completely safe! There were fears of rioting, but these had nothing to do with the 40,000 fans in the stadium, rather with the outcome of the “election” for the new chief executive. Leung Chun-ying won. 1193 “leaders of the community” chose him. There are about 7 million people living in Hong Kong. Many are frustrated that they still do not have the right to vote (it is now promised for 2017) and that Beijing’s favorite always wins. Before the new leader is chosen there is a great deal of campaigning and much of it is nasty. The Taiwanese newspaper, The China Post, points out that in Hong Kong you get the disadvantage of democracy (the mud slinging) with out the advantages of a leader chosen by the people. We didn’t see any trouble but the press reported some protests. We were too busy celebrating Canada’s victory in the qualifying tournament to worry about politics. They won all three of the games they played on Sunday, gaining core team status. This gives Canada a place in the 15 country World Series tournaments for next year. We were very lucky to be invited to watch the last few hours of this tournament from a box right on the 50-yard line (thank you Randy and Ferg!!!). 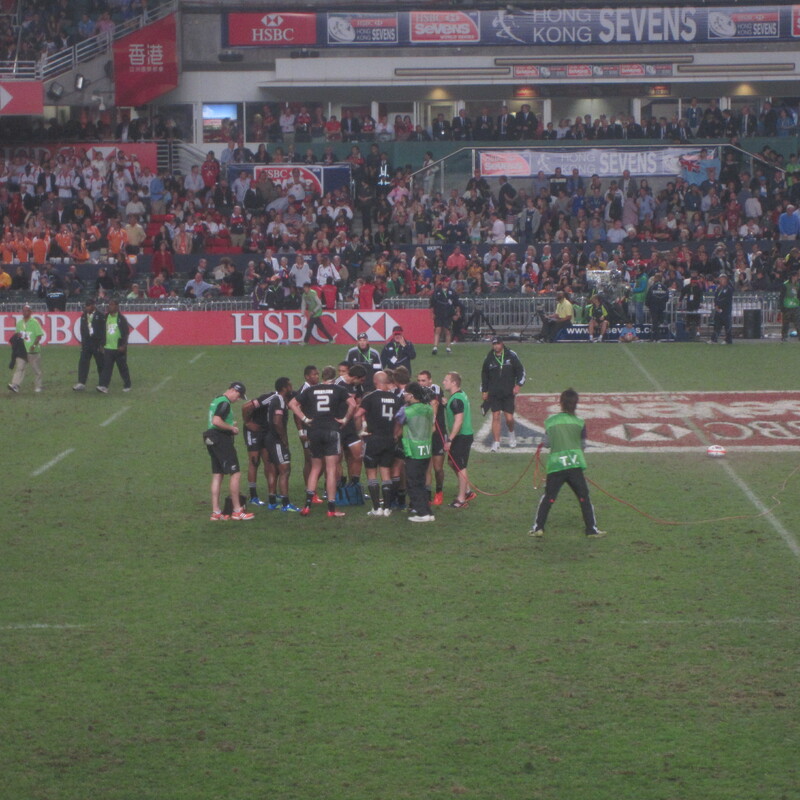 The final match, in which Fiji beat the favoured New Zealand team, was incredibly exciting. The winning try was scored with only two minutes left! 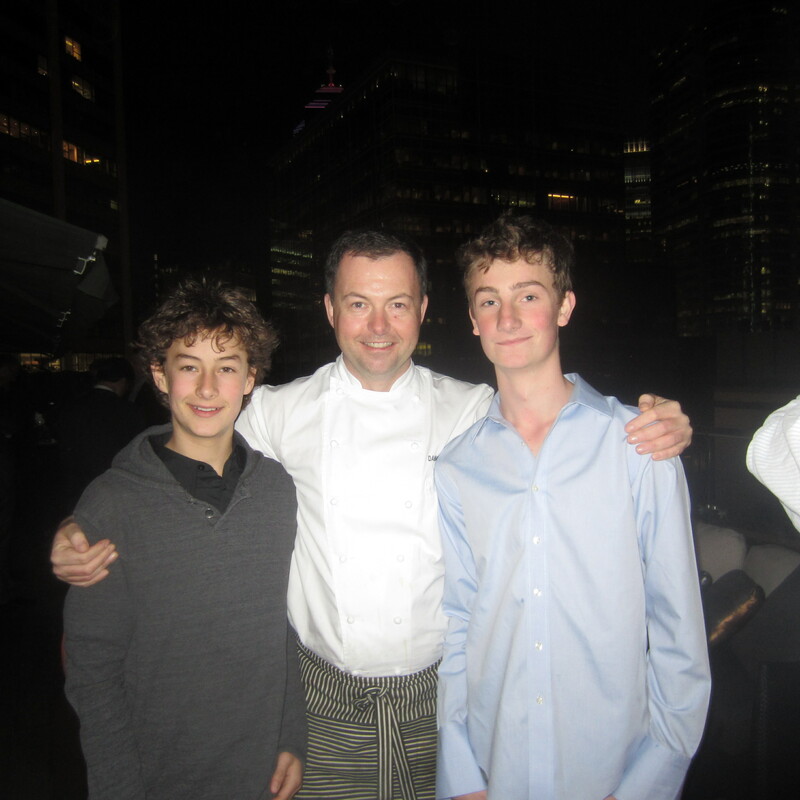 After five days of enthusiastic celebrating in Hong Kong (our last night at the restaurant Sevva where David Hawksworth was guest chef!) we are delighted to be back in Beijing. Spring has arrived. We are relishing the warm weather and a chance to rest! It sounds like you all had huge amounts of fun !! I so enjoy seeing the pictures you include. I knew that Beth and her kids and the Ratner/Killis family would be visiting you and I especially liked the photos of the kids together in their jerseys. We went to Europe for the Break; the kids were taking part in an exchange with a school in spain, and Bill and I covered a bunch of ground, some of it together and some of it separately. We both went to Finland to see my older son and then Bill left for Vienna and Budapest while I went to Barcelona with Stephen and his girlfriend. We arranged to meet in the south of France after a few days. I had rented a car while he took the train from Hungary. It was kind of like The Great Race but with only two participants! Keep those posts coming – always enjoy them.